It's the most-visited national park for good reasons. Among them: 850 miles of hiking trails, brilliant fall color, impressive waterfalls and top-notch campsites. Everyone says you have to see Great Smoky Mountains National Park. But being a “must see” doesn’t mean it can’t surprise you. Learn more about this classically North Carolina destination, and then go beyond the guidebook with our insider tips. It’s the most visited site in the national park system, and with good reason: Great Smoky Mountains National Park boasts some of the tallest peaks in the eastern United States, an ecosystem that contains 100,000 different types of plants and animals, 850 miles of hiking trails, brilliant fall color, impressive waterfalls, top-notch camping sites and more than 90 historic structures. The park covers 521,085 scenic acres along North Carolina’s western border. The main entrance is just outside of Cherokee on U.S. 441 North at the Oconaluftee Visitor Center, which is open year-round. This is an ideal place to begin your visit – nature exhibits, a bookstore, a re-created mountain farm and an easy talking trail along the Oconaluftee River all set the scene for your park visit. From here, a world of outdoor opportunity awaits. 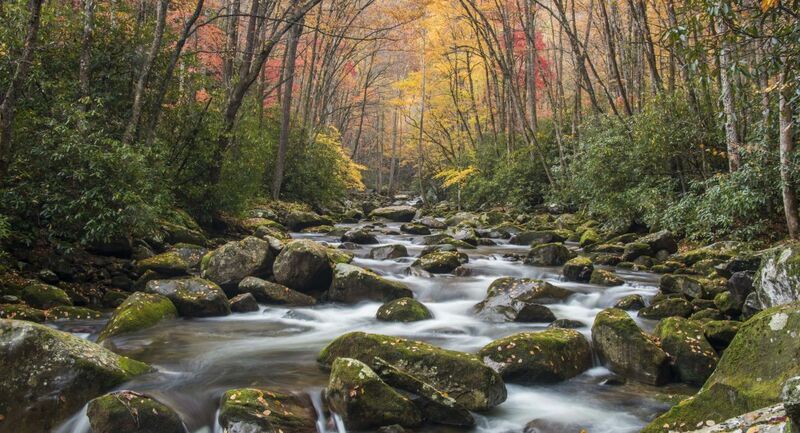 There are 384 miles of road to choose from in the Smokies, and auto tours of the park offers access to panoramic views, rushing mountain streams and waterfalls, weathered historic buildings and lush hardwood forests stretching to the horizon. For those wanting to get a more up-close-and-personal view of the park, hiking trails abound. Andrews Bald is one of the Smokies’ finest moderate hikes. The trip passes through an extraordinary spruce-fir forest to the grassy field of Andrews Bald. With stunning views, this is an ideal spot for a picnic in the sky. Big Creek is an easier walk and a perfect hike for less experienced or first-time hikers. 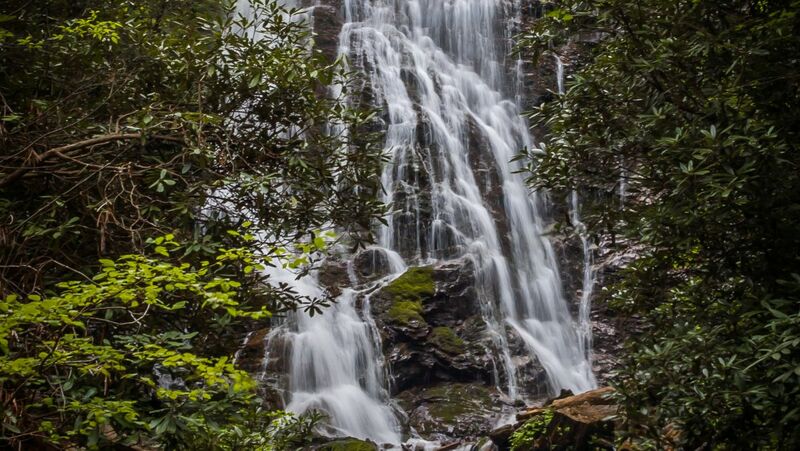 The trip provides gorgeous scenery with abundant wildflowers and a view of Mouse Branch Falls. While you’re here, you’ll be part of one of the most diverse ecosystems on earth. The park protects 66 species of mammals including elk and black bear, 200 varieties of birds, 50 species of native fish and more than 80 types of reptiles and amphibians. The upper elevations of the Smokies receive an average of 85 inches of rain each year, qualifying them as a temperate rainforest. With all this biodiversity in a relatively small area, the United Nations has designated Great Smoky Mountains National Park as an International Biosphere Reserve. There’s a great deal of human history here – the park is part of the Blue Ridge National Heritage Area. From native Cherokee (whose 18th-century lives are re-created at the nearby Oconaluftee Indian Village) to the Scots-Irish settlers, visitors can experience the rich history and culture that springs from these mountains. Close to 100 historic structures, including homes, schools, churches, barns and grist mills, preserve Appalachian mountain heritage. One of the first and most welcome facts you’ll learn about the park is that there’s no entrance fee. But as any visitor can imagine, it takes an overwhelming amount of work to protect and maintain all of the Smokies’ natural wonders. Consider visiting the park as a volunteer through one of its excellent opportunities for getting involved, including longer-term positions as well as single-day events for visitors who can’t commit to multiple days. There are so many ways to get involved and make your visit a meaningful one.